(Possibly) Talon; sale, Fievez Brussels, 10 March 1927, lot 107, as A. van de Venne. (Possibly) A. Plokker, Adriaen Pietersz. van de Venne (1589-1662) de grisailles met spreukbanden, 1984, p. 243, no. 104, as A. van de Venne (unseen). A print by Cornelis Dusart, signed and dated 1695, bears the same inscription 'NOS SUMUS SEPTEM" (Holl. 41). In Dusart's mezzotint a buffoon is shown seated on a donkey, with a young boy seated on his neck. 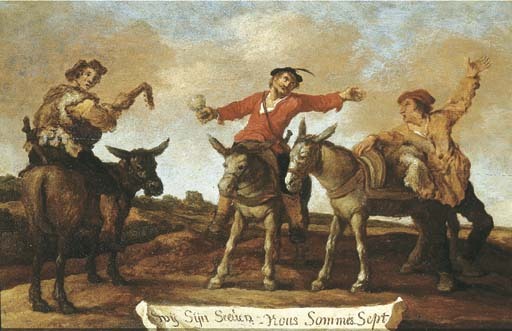 An owl is perched on the donkey and a boor holding a swine is standing nearby. As in the present picture, only six figures are shown, although the inscription remarks that there are seven - the seventh buffoon being, of course, the viewer.